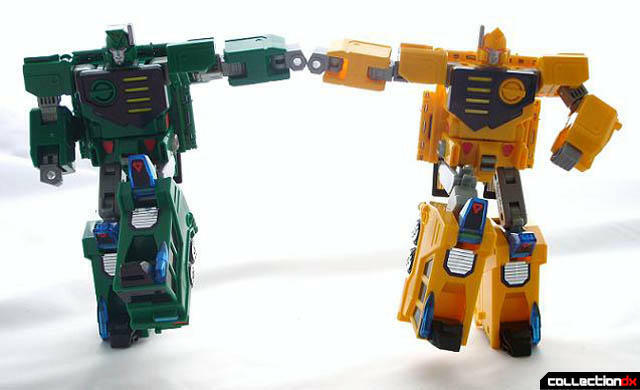 The Symmetrical-Docked form of HyoRyu and EnRyu, formed when their "SympaRate", a measure of their synchronization and unity of purpose, reaches 100%. ChoRyuJin is a defensive specialist with his Mirror-Coating Chestplate (which he uses at the risk of his life) and ability to use the Eraser Head tool. He also possesses HyoRyu and EnRyu's Gun, Rifle, and Tonfa attacks, usually used in "Double" form firing from both sides at once. He can also fire both guns and both rifles at once for a full-burst-style attack. After the initial Primeval attack, ChoRyuJin is retrofitted with the ability to fire Ul-Tech beams in place of heat or cold, which appear similar to most beam weapons in anime. In technical specifications (and finally shown in FINAL), he also has the desperate final attack "Super Nova" - in which HyoRyu and EnRyu turn their respective dials to "Infinite" and simultaneously blast the enemy with their Chest attacks. 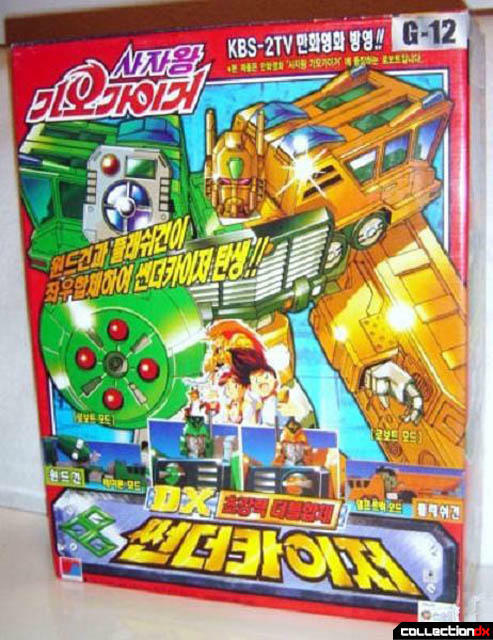 Due to the placement of the chest plates on ChoRyuJin, he could not in fact use this attack while Symmetrical-Docked. Today I will be reviewing Sonokong's re-issue of GekiRyuJin giftset. 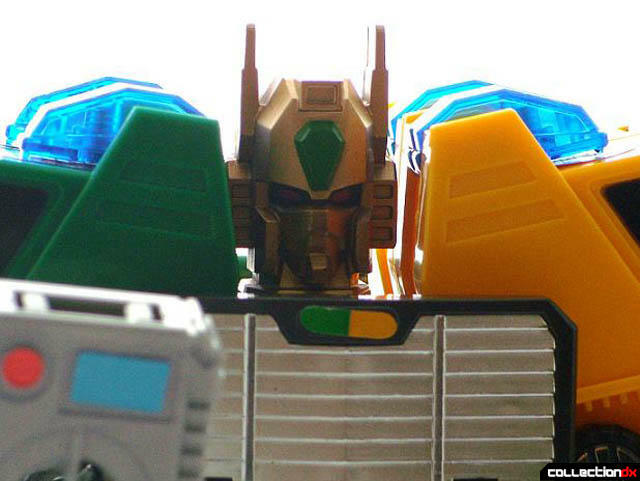 The set includes both symmetrical docking robots, RaiRyu & FuuRyu that make up the larger GekiRyuJin. RaiRyu and FuuRyu are one of two sets of symmetrical docking robots that appear in the anime The King of Braves GaoGaiGar, the other set being EnRyu and HyoRyu that make the larger robot ChoRyuJin. I will cover ChoRyuJin in a future review. Since you can purchase the set combined or individually, I have included photo of all below. 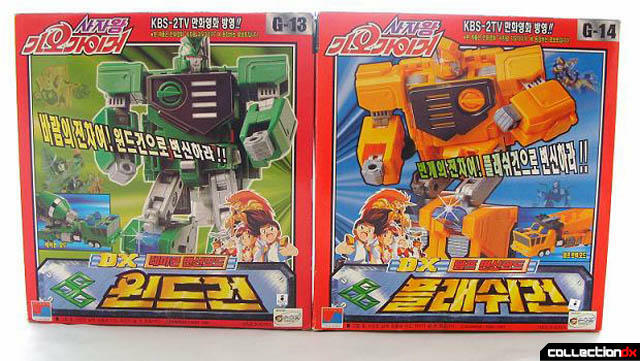 The packaging on the combined giftset version is the nicely illustrated heavy corrugated cardboard box with the plastic tray insert that in the norm for Sonokong Brave Series re-issue. As for the individual pieced boxes, well...they are nicely illustrated but the box is very light cardboard that I suspect will not hold up to years in storage of moving. 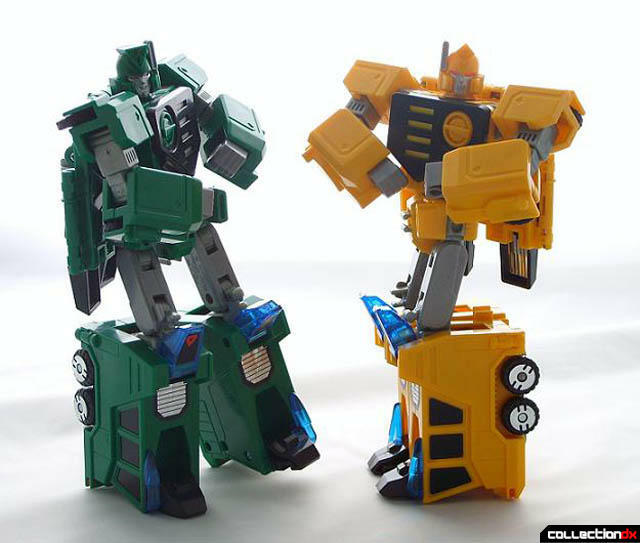 Lets start off the review with the vehicle modes of the two separate robots. 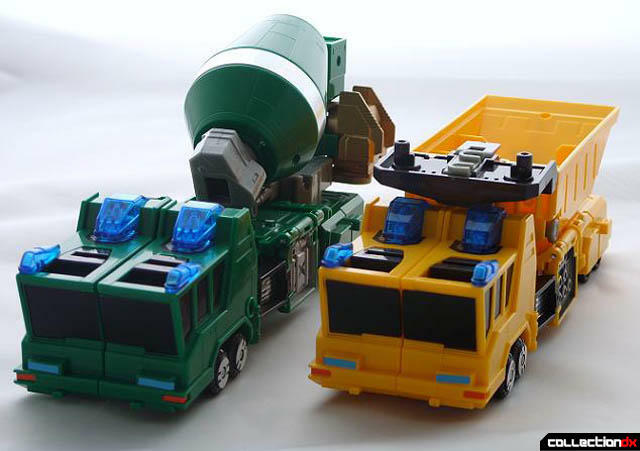 In the first photo below you have both the green cement truck (FuuRyu) and yellow dumptruck (RaiRyu). As you can clearly see, they share a very futuristic look, which is appropriate for the anime they come from. 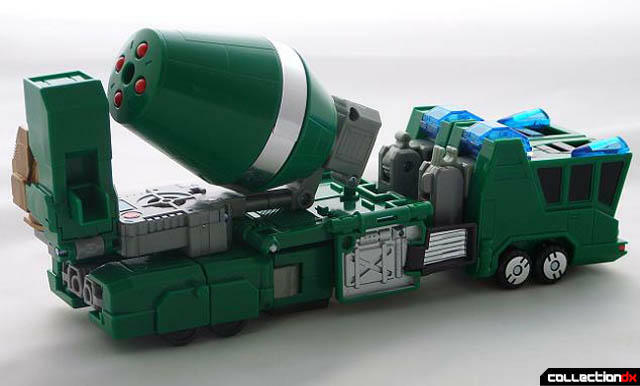 Each truck is just under 10" long in this mode and is comprised of quality feeling heavy plastic. 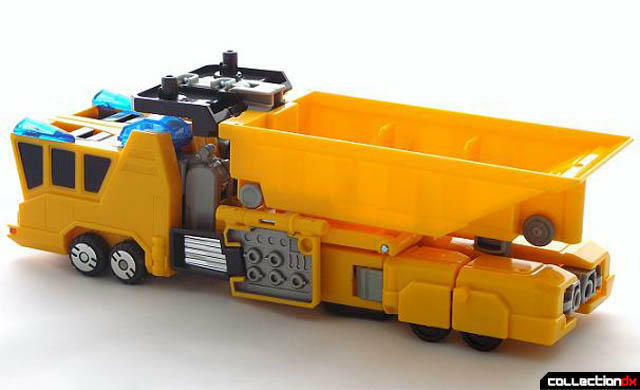 The only feature or "gimmick" that RaiRyu has in dump-truck mode is the fact the dump body actually can tilt back to dump. Nothing really impresses me with his vehicle mode. Now we are getting down to the good stuff! RaiRyu's and FuuRyu's separate robot modes are arguably the best mode of these figures, due to their almost unheard of articulation for an early nineties transforming robot figure. Each figure stand approximately 8" tall, and like I state above, both have some really good articulation. 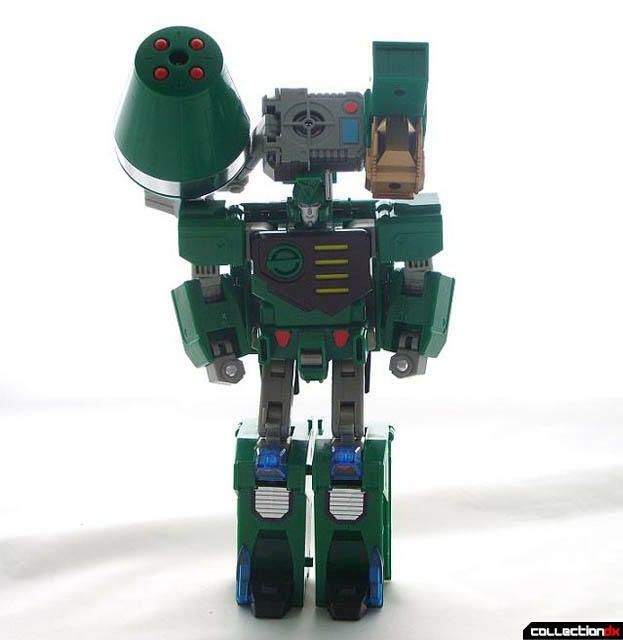 The joints are nice and tight with that "click" that all mecha collectors love. 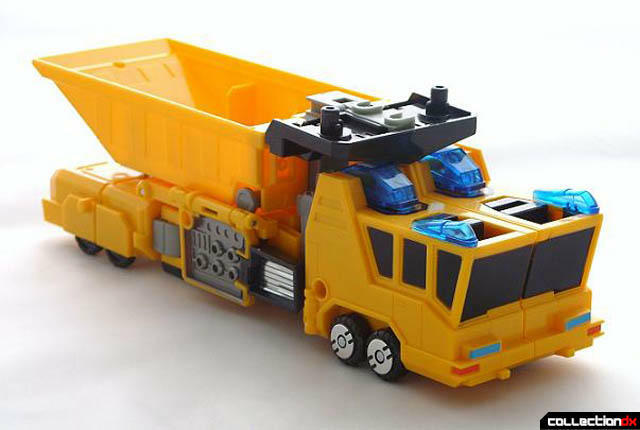 Transformation to robot mode is a snap, and as you can see below, for the most part they look great, if you overlook the kibble on their backsides. Just like in the anime, you can turn the dials on both RaiRyu's and FuuRyu's chest to "Infinite" and simultaneously blast an enemy with their Chest attacks. 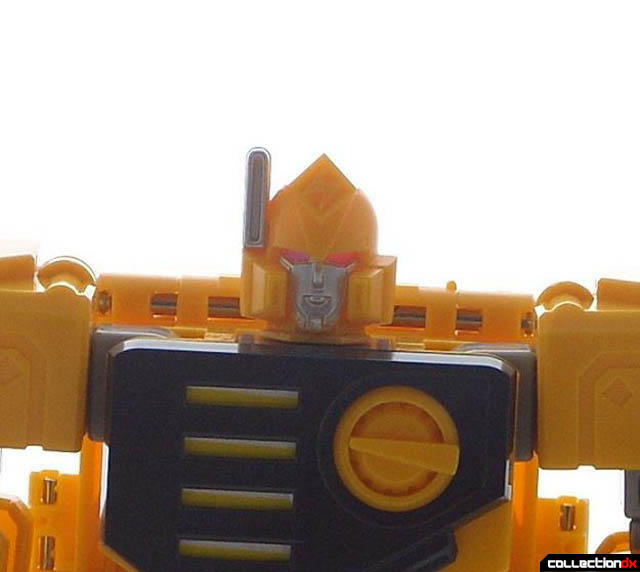 You can see below that the chest changes from white to yellow or vice verse to achieve the above mentioned effect. Now lets take a look at FuuRyu alone. 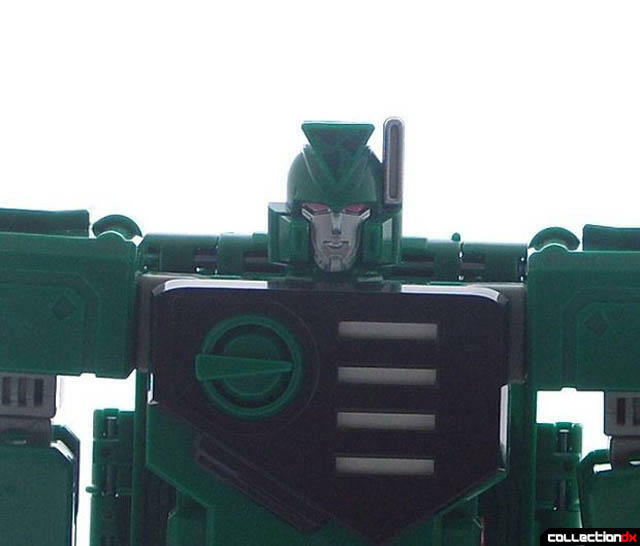 In the first pic you can see the nicely detailed face and chest that really contribute to this figures cool factor. Here is a quick shot of the articulation that I had mentioned earlier in the review. You gotta admit that it is pretty awesome for a Brave Series figure. Well, check this out! What I originally thought to be useless kibble shown in the backside shot up above, becomes a nifty shoulder mounted cannon with targeting system. The cannon actually can fire 4 of the 16 supplied red projectiles by simply rotating it. 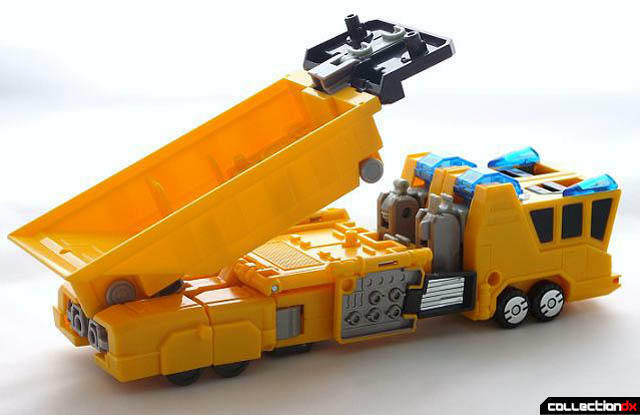 Don't you just love toys with firing gimmicks? RaiRyu shares the same chiseled good looks as FuuRyu above as well as the pretty cool articulation. Only this time, the play gimmick is different. RaiRyu can actually use his dump body as a skateboard! Hang 10 dude! or whatever the skating lingo is...LOL. 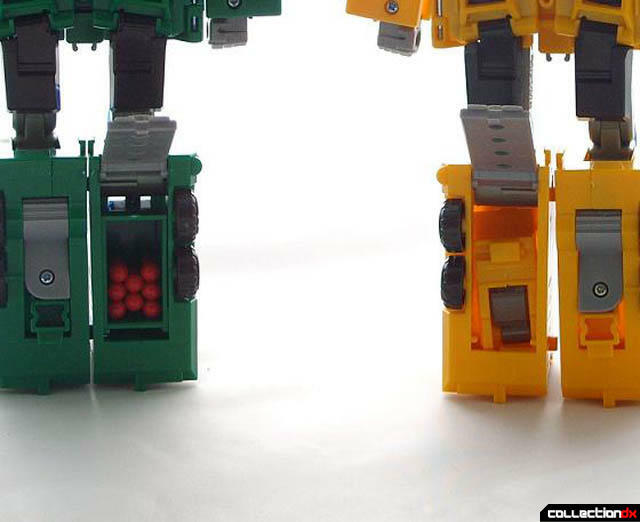 The next photo illustrates how the storage of the extra ammo and the arm for GekiRyuJin are stored in the lower legs of RaiRyu and FuuRyu. 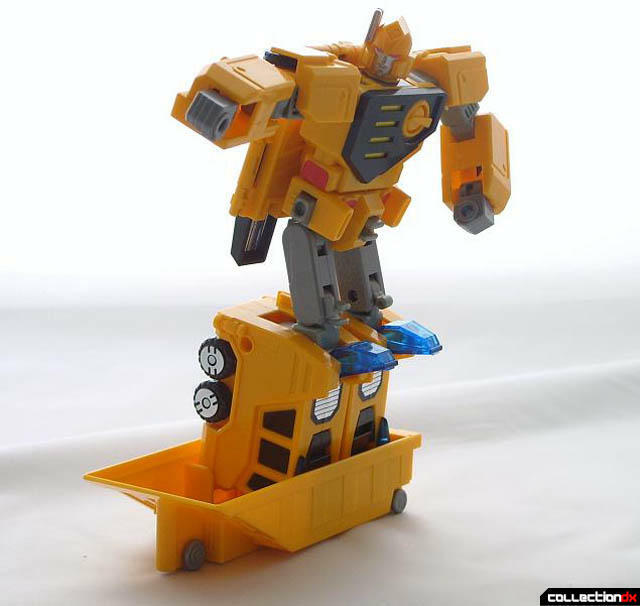 I think that this is pretty cool and I love toys where everything has a place. Also, you can check out the video further below and you will see that the left arm of GekiRyuJin actually stores in the exact place as the toy! Pretty trick huh? As you can see below, RaiRyu and FuuRyu are starting to get impatient and would like me to hurry up to the part where they can do their ultimate symmetrical docking form, GekiRyuJin! OK boys, lets go, SYMMETRICAL DOCKING!! Here he is, GekiRyuJin in all his glory! If you watch the video above, the transformation of the toy to GekiRyuJin is practically exact to the anime. GekiRyuJin stands a little over 10" and is basically a solid brick. 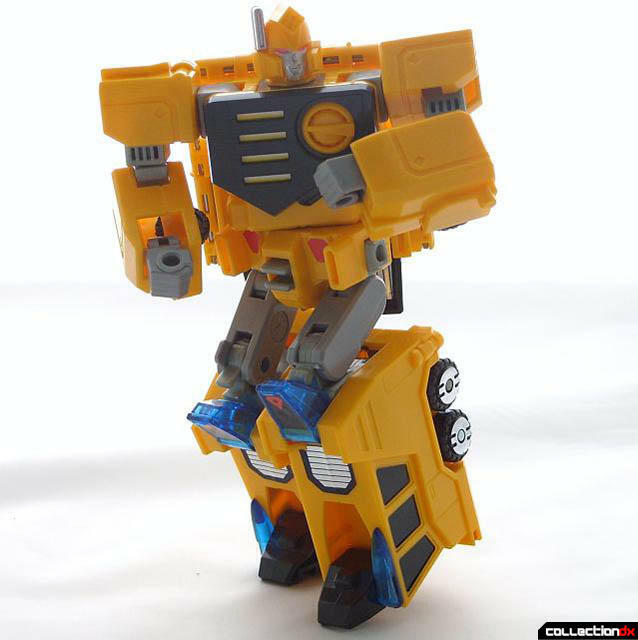 Articulation is limited to the elbows and the head does turn back and fourth slightly between his massive shoulders. Even though the articulation is limited, I still think the figure is beautiful and well proportioned. 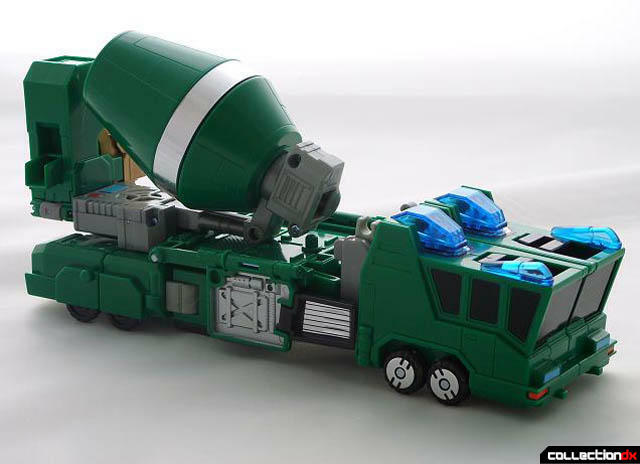 I like the way the cement drum becomes his gun and the dump body is his shield. 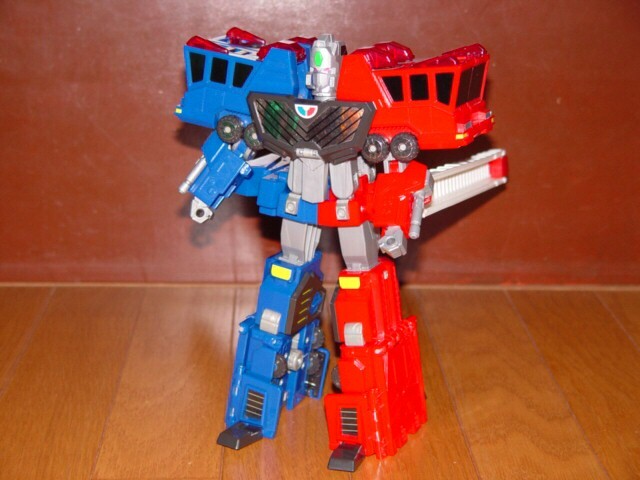 Maybe its just me but I think GekiRyuJin and Optimus Prime have a striking resemblance. All said and done, I love this toy and I am proud to have it displayed in my collection. I think the design is really cool and it just looks absolutely stunning on the shelf next to my other Brave Series figures. If you don't have it, track it down. It is worth hunting around for. 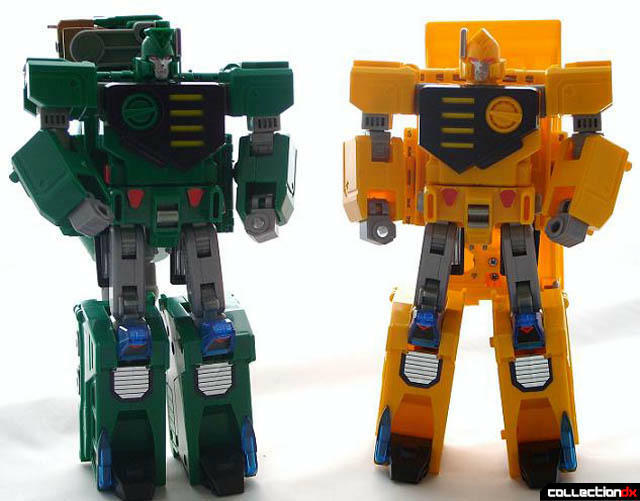 Yes- I've seen these two before, but didn't know they were from "GaoGaiGar"! I've loved the symmetrical design of these... but I thought one of them was a ladder truck...? But, seeing the Fire Dagwon and such years earlier made me think that "Fighbird" wwould be as far as I planned to go. Dan, thank you for sharing these with us! Eva, another pair of symmetrical docking twin robots appear in GaoGaiGar, one in the ladder truck you are talking about and the other is a crane truck. I will be covering those soon. 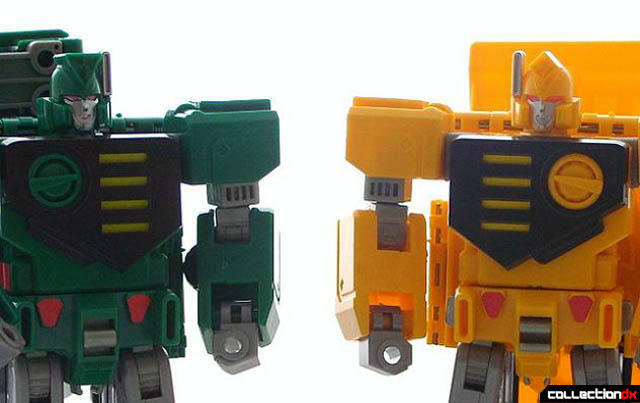 There's actually a third pair of twin bots, this time females, one becoming a Dish radar thing carrier and the other a missile silo carrier; no idea if they ever got toy versions who. Oh, I saw those on YouTube just the other day! Unless they couldn't compensate for the differently-shaped torsos (which might not look the best in toy-form, but wouldn't be impossible), I'd be surprise if they didn't exist out there somewhere. 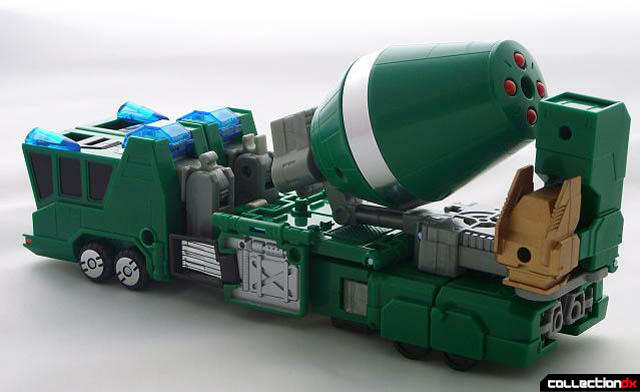 "Don't you just love toys with firing gimmicks?" Rairyu actually flies around on his dump bed all Son Goku style, which makes sense considering Fuuryu and Rairyu are Chinese built robots in the show. They also call out their attacks in Chinese. Great review it's a joy to see so much brave stuff on here. The Ryu Brothers are really hard toys to track down for a good price. Nice review, I really like the pictures. I appreciate that. I've been waffling back and forth about getting them for that price. I might finally give in. I wonder why they're so hard to get a hold of? 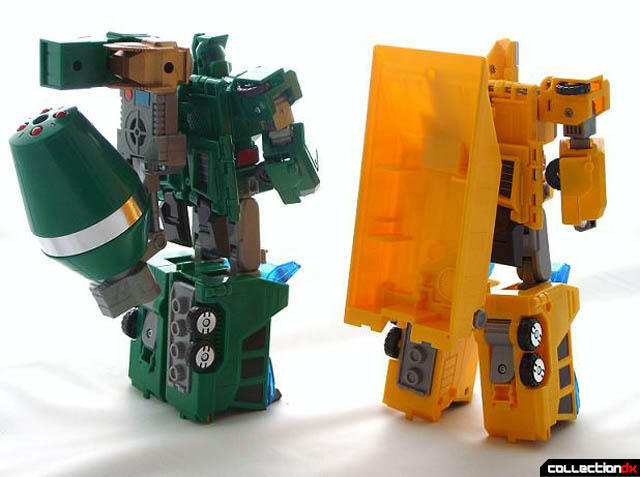 Anyway, are you able to say how tall the individual robot modes are? Just an observation (hope I'm not spoiling the mood). The Chinese and Japanese Dragons can mix-and-match to form GenRyuuJin and GouRyuuJin. Awe man! You totally destroyed my surprise, LOL just kidding! I get to those later in my review of ChoRyuJin. i watched gaogaigar so i saw that coming but great review anyway, it makes me want to buy moore brave toys. "it makes me want to buy moore brave toys"
Hear hear... 'cept for the spelling error. There were no transforming Kouryu and Anryu toys ever made. 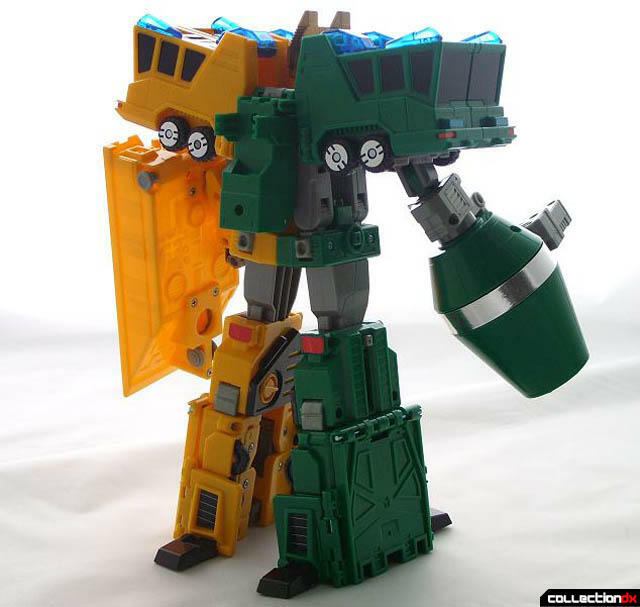 Takara did not make any toys for Gaogaigar Final. 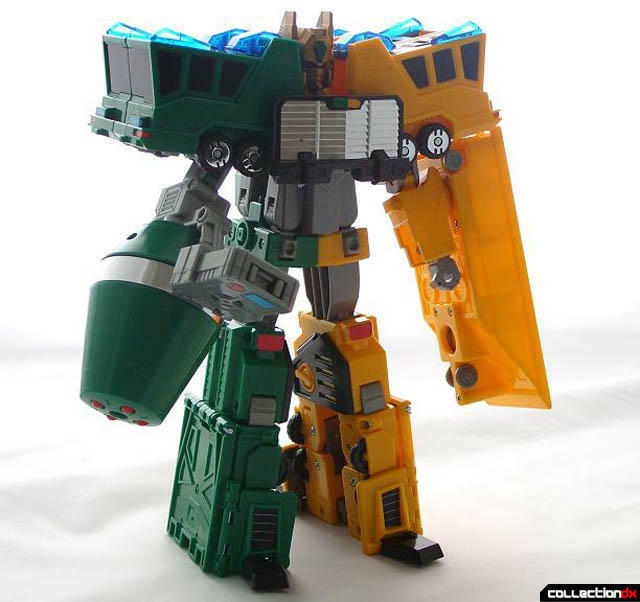 Which is why a Takara DX Genesic GaoGaiGar only shows up in my dreams. 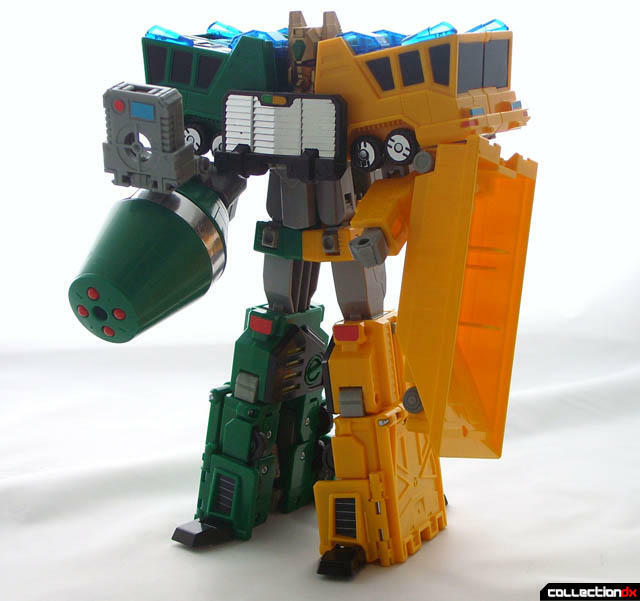 Takara should get to it and make a Masterpiece Genesic Gaogaigar. Based on the Japanese gods; Fujin and Raijin, though ironically enough in the anime they were built in China, these two are simply made for each other. 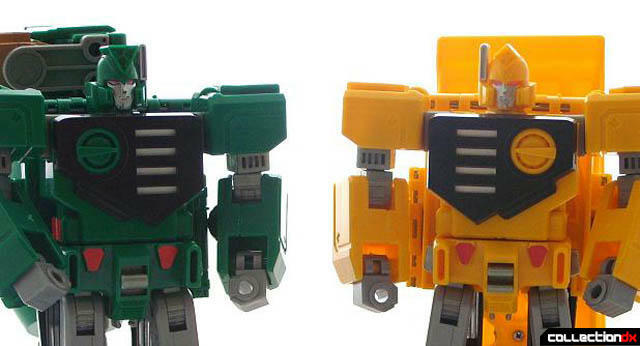 Takara certanly knew what they were doing when they produced these characters. Superb review on these great toys. I can't say Gekiryujin's face looks like Optimus but more of Bruticus because both are military robots and the same rank applies for Gekiryu. 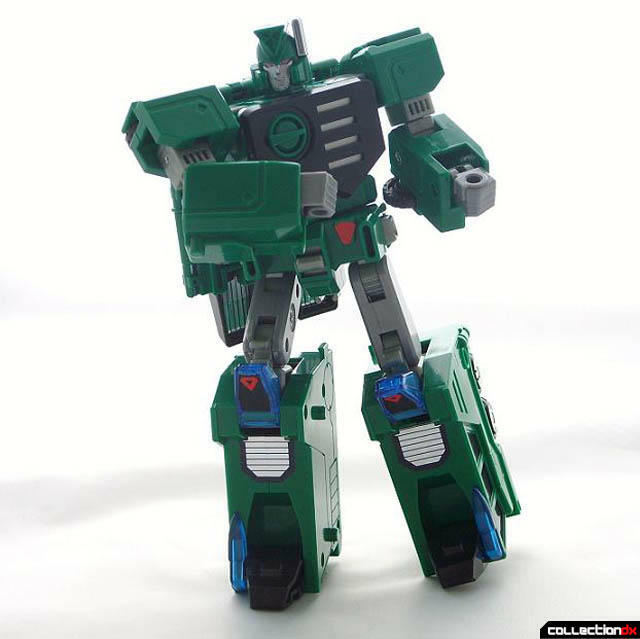 Blows my mind..
Dan, would you happen to have a review of the DX Super build tiger? Sorry if I'm off topic here.